My Year 2003 was begun on the streets and in restaurants in Rome on Messerli's trip there in October. At the time he had not yet clearly marked out what he was attempting to do in these cultural essays, of which this is the fourth volume. It was not until a short essay on John Ford's legendary The Searchers, he notes, that he began to understand a connection between the various pieces he had been writing in 2003. What struck him about Ford's picture was that, although it attempted to tackle the subject of a settler culture determined to wipe out Native Americans, only the white settlers and the Indian hater, Ethan Edwards, were allowed to speak. It was, accordingly, a work which presented a voice that had been given little to say. It quickly became apparent that this "voice without a voice" was an issue in a great many of the works on which he'd been focusing throughout the year. 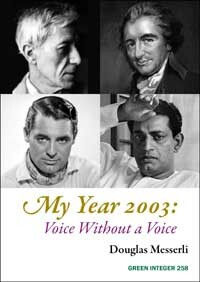 Not only did the books, plays, films, artworks, and performances of 2003 present figures who had little voice in the dominant culture, but many of them -- out of cultural differences, linguistic gaps, or personal desire -- had been quieted. Although these figures -- the poor Indian families of Satyajit Ray's Apu trilogy, the singer Garþar Hólm of Halldór Laxness's The Fish Can Sing, the Canadian Québecois writers Nicole Brossard and Densye Delcourt and filmmaker Denys Arcand -- were often seen as representatives of their country, their contributions to the dominant culture were fairly unknown, described as eccentric, or simply stood at a distance from the rest of their culture. Others such as the "Language" poets of the US and the XUL poets of Argentina had chosen to speak in a language that challenged and questioned the popular culture. Some figures who had fully represented and defined their cultures -- writers such as Thomas Paine and Mohammed Dib -- as expatriates later found themselves despised or shunned within the countries they had helped to shape. The vast majority of the works Messerli explored in 2003 spoke to audiences on at least two levels: on one level expressing the interests of the mass culture and, on a different level, speaking to another audience sensitive to voices that generally went unheard. Author of the fiction Letters from Hanusse, collections of poetry First Words, After, Bow Down, Maxims from My Mother's Milk and Dark, and plays (under the name Kier Peters) such as The Confirmation, Past Present Future Tense, and A Dog Tries to Kiss the Sky, Messerli is the editor of Green Integer, formerly Sun & Moon Press. In 2004 he was named Officier de l'ordre des Arts et des Lettres by the French government.